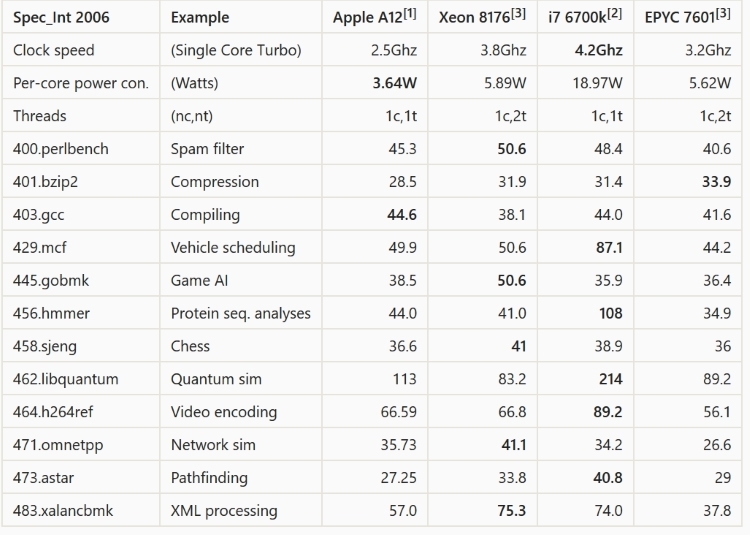 Why does the Apple A12X processor have better benchmark results then the i7-4790T? In my workstation I have an Intel i7-4790T that I've always thought was a pretty fast CPU. But according to Geekbench 4 the Apple A12X processor in the new iPad Pro comfortably beats it. When I run Geekbench 4 I get a single core speed of around 4,000 but on the new iPad Pro the A12X processor returns around 5,000 i.e. 25% faster. In fact even the A12 and A11 score more than my i7-4790T. On the multicore test my CPU scores a shade over 11,000 while the A12X scores 18,000, which is a whopping 60% faster. A preliminary question is whether Geekbench is a reliable indicator of real world speed. For example the only thing I do that really stresses my CPU is video resampling with Handbrake. Handbrake isn't available for IOS, but assuming it was ported would Handbrake really process videos 60% faster on the A12X, or is the Geekbench score unrepresentative of real world performance? But my main question is this: leaving aside exactly how the A12X and my CPU compare, how have Apple managed to get an ARM based RISC chip to be that fast? What aspects of its architecture are responsible for the high speed? My understanding of RISC architectures is that they do less per clock cycle but their simple design means they can run at higher clock speeds. But the A12X runs at 2.5GHz while my i7 has a base speed of 2.7GHz and will boost to 3.9GHz in single core loads. So given my i7 will run at clock speeds 50% faster than the A12X how does the Apple chip manage to beat it? From what I can find on the Internet the A12X has much more L2 cache, 8MB vs 256KB (per core) for my i7, so that's a big difference. But does this extra L2 cache really make such a big difference to the performance? The Geekbench CPU test only stresses the CPU and the CPU-memory speeds. The details of exactly how Geekbench does this are described in this PDF (136KB). The tests appear to be exactly the sort of things we do that that use lots of CPU, and it appears they would indeed be representative of Handbrake performance that I suggested as an example. The A12X is an enormous CPU built on the latest technology, leaving far behind the older i7-4790T dating from 2014. First difference is the manufacturing process: The A12X is a 7 nm chip, while the i7-4790T Haswell-DT is built on older 22 nm. Smaller transistors mean less space, less operating power and faster signals across shorter chip paths. The A12X has a whopping 10 billion transistors, while the i7-4790T has only 1.4 billion. This allows the A12X to have six integer execution pipelines, among which two are complex units, two load and store units, two branch ports, and three FP/vector pipelines, giving a total of an estimated 13 execution ports, far more than the eight execution ports of the Haswell-DT architecture. For cache size, per core we have on the A12: Each Big core has L1 cache of 128kB and L2 cache of 8MB. Each Little core has 32kB of L1and 2MB of L2. There’s also an additional 8 MB of SoC-wide$ (also used for other things). Haswell architecture has L1 cache of 64KB per core, L2 cache of 256KB per core, and L3 cache of 2–40 MB (shared). It can be seen that the A12X beats the i7-4790T on all points and by a large margin. Regarding RISC vs CISC architecture, this is now a moot point on modern processors. Both architectures have evolved to the point where they now emulate each other’s features to a degree in order to mitigate weaknesses. You are comparing very different architectures between the A12X and Haswell (Intel i7-4790T), and the benchmark numbers are not directly comparable, much as the two processors are not directly comparable. Understanding what a particular test is testing is helpful in trying to understand what the numbers mean. Going through your geek bench test, let's start at the last line. Per your GeekBench tests, the memory bandwidth between the A12X and the haswell chip is heavily skewed. The A12X has roughly twice the memory performance. While Memory tests typically conflate two unrelated items, latency and bandwidth, the A12X is the clear winner here. The next item is floating point performance. This test is trying to compare hand optimized code between different architectures. While the numbers may be skewed by the quality of the optimizations, this should be a good ballpark to overall FPU performance and is directly comparable. Here the two processors have similar results. The least helpful test is the test labeled integer performance. It isn't integer performance in the arithmetic sense, it is more so a collection of non-FPU generic workloads. These tests are meaningful in that they show application performance on a platform, but they aren't meaningful to say that processor A is better than processor B as they are somewhat sensitive to memory performance. Last is the Crypto work load. This is meaningful in the abstract, although the particular test probably isn't that useful. High performance crypto should be using AES-GCM not AES-CTR, the latter of which doesn't lend itself to to hardware acceleration as well. This is also a domain specific benchmark. The A12X has significantly improved memory bandwidth. This is partially because desktop memory seems to lag behind the then current memory technologies, but also because memory performance has improved in five years. The A12X has slightly better FPU performance per core than the i7-4790T. The A12X is going to run generic work loads similar to or faster than the i7-4790T. The A12X is much better at domain specific work loads as it provides hardware support for new and different instructions that better reflect the needs of a tablet/cell device. Drawing larger conclusions based on those numbers, or making architectural claims based on those numbers is probably unwise. As to a generic architecture comparison, RISC vs CISC is no longer meaningful as both instruction sets are decoded into micro-ops which determine how the workload is distributed. Comparing based purely on execution ports is probably not particularly meaningful as those are high level building blocks which are not directly comparable. Cache is an important quantity that directly contributes to processor performance, but it is also very complicated. How cache is shared between the intel architecture and the A12X is completely different. In general, having more cache is better, but just as important is cache coherency which affects how threaded applications are able to share data between cores. Lastly, the processor needs to work for your workload. While the A12X may be able to support a desktop workload at some point in the future, the i7 v4 supports it now, and that makes it a superior choice for a desktop processor even though it is four to five years older than the A12X. Not the answer you're looking for? Browse other questions tagged cpu performance ipad or ask your own question. Why did CPU clock speeds stop increasing? Will a new processor with slower clockspeed run legacy applications faster? Why is the i7-5960x only 3.0Ghz, while the i7-5930k is 3.5Ghz? What is the significance of CPU clock speed differences between different generations/types of processors? How do I decide between CPUs with different clock speeds, number of cores and L3 cache sizes?